How one state used CDC’s National Violence Death Reporting System to help inform policy change. 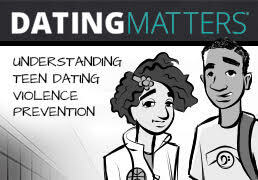 Interested in learning more about teen dating violence and how to stop it before it starts? These events can help. Dating violence can happen to any teen at any time, anywhere. Use CDC’s resources to bolster your prevention efforts. Details and registration information for an upcoming webinar hosted by CDC and the Association of State and Territorial Health Officials. Violence has a negative impact on everyone: our neighborhoods, our communities, our families, our health. This supplement explains how it can be prevented. Statistics and resources you can use in support of the 12th observance of National Stalking Awareness Month. CDC’s research and community work underscores the importance—and possibility—of preventing youth violence. A new report and action guide provides strategies that can help. Emory Center for Injury Prevention and Control to host a Brown Bag lecture on January 8, 2015. Access information on violence against children and youth anywhere, courtesy of WISQARS Mobile.